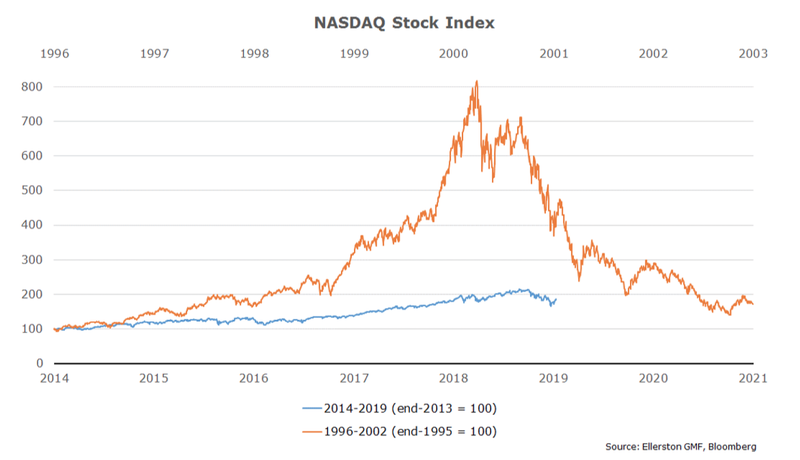 So am I drawing an analogy between the tech crash in 2000 and the tech (FANG) crash last quarter? Well the price action might suggest so. Scary right? Only if you are naïve, which I’m sure most of my readers aren’t! As they say there are lies, damn lies and statistics. If we normalise the scale, we can see the Dot-com bubble was about 4x larger. 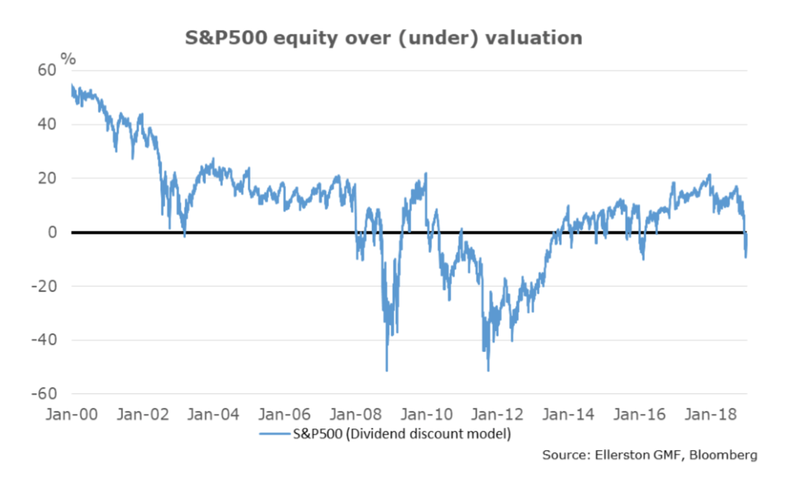 Indeed, on Tim’s valuation measure, US equities are now fair value. Not cheap mind you, just not expensive. Indeed, we now have a catalyst to re-enter equities. The Fed. On Friday, January 4th Powell declared the Fed on hold. Speeches from all the Fed governors, including another from Powell, on Jan 10th, re-enforced the message that the Fed will be patient and watch the data for the next 6 months. 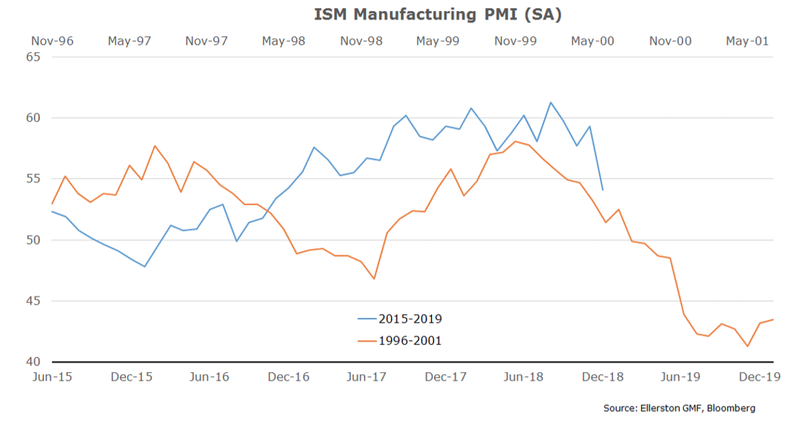 Powell even opined that there was no bubble in markets, rates are below “neutral”, and so he saw no reason not to hold to their forecasts of above trend growth for 2019. And then he added the magic balm. He noted that financial conditions had tightened significantly, like 2016. And he noted that if it is like 2016, the fed will stop hiking, as they did in 2016. 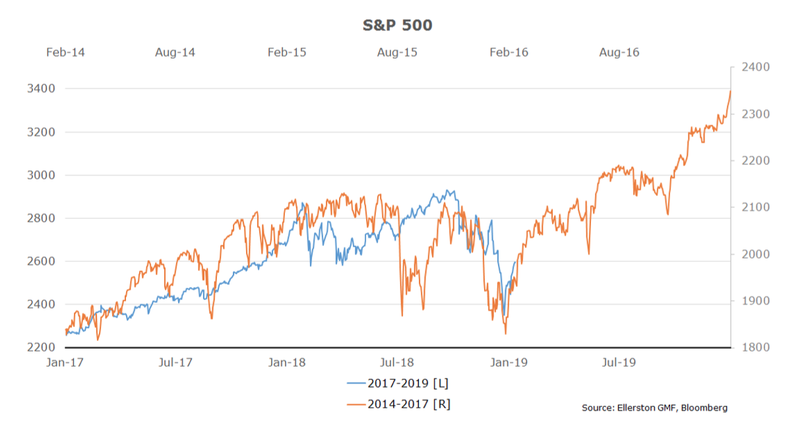 The soothing messages from Powell eased market concerns, rallying the equity market and credit markets in early January, and halting the tightening in financial conditions over the prior two months at about the same amount as 2016. Perfect. The FCI has tightened about as much as it did in 2016, and the Fed has promised to react the same. So markets will repeat the performance of 2016 now. They well might. As long as there is no bubble bursting. Which I just said there wasn’t, right? Well no, I said we didn’t have a bubble bursting in the equity market. But as regular readers will know, I have been talking about a bubble bursting in credit since June. But here’s the rub. 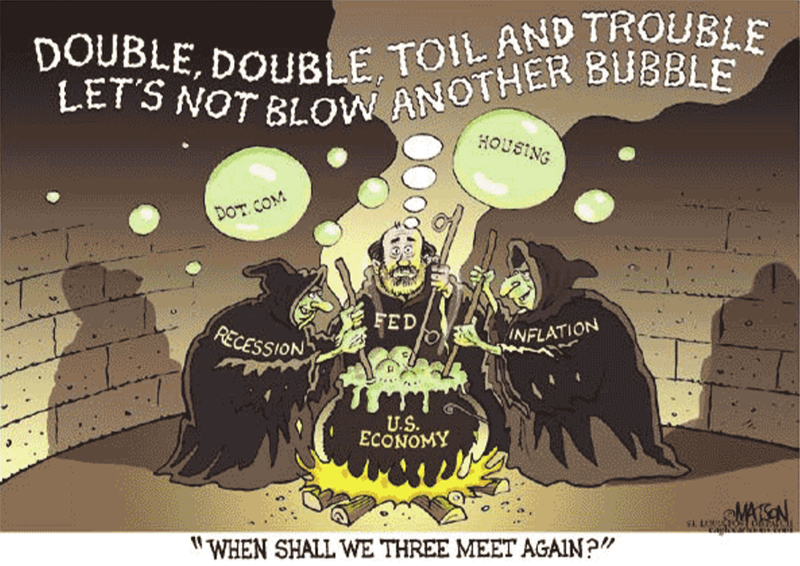 One can never be sure on the exact timing of when a bubble will burst. As fund managers found out in 1999/2000...Or indeed a few Bitcoin investors last year. My last two newsletters have focussed on the credit bubble bursting, and some early signs in the price action that the prick was in. But Powell has come to the rescue, and credit loved it. Has he saved the market? At least for now? I’m afraid I don’t know the answer to that question. At least not in the short term. In the long term no. I’m stridently critical of the rolling asset bubbles the Fed has been driving since 1996, with super low rates for super long times driving more and more debt into economies and creating more and more busts. But Powell may well have bought some more time. The best thing we can do right here and right now is be open to possibilities. In particular, two. That Powell has bought more time, similar to the 2016 analogue. The credit bubble is bursting, and this is but a brief respite, similar to the 2000 analogue. How do we decide? First step is to have a close look at how markets and economic data behaved in each episode. In the chart below I line up the price action into and out of the peak stress in 2016 and last month. Interesting fit. Powell noted when the Fed met in December 2015 and hiked, and they forecast (via their dot plot) 4 hikes in 2016. They only delivered one in December 2016, 12 months later. 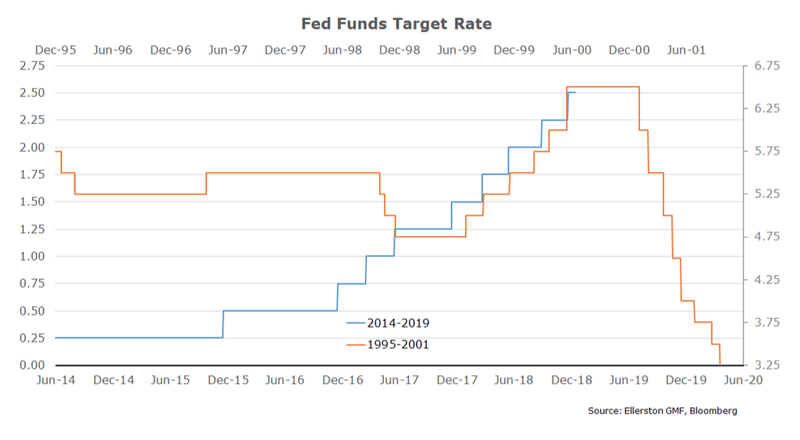 Market pricing of Fed hikes evolved quickly. The chart below shows the expected change in the cash rate over the next 12 months using the same dates. 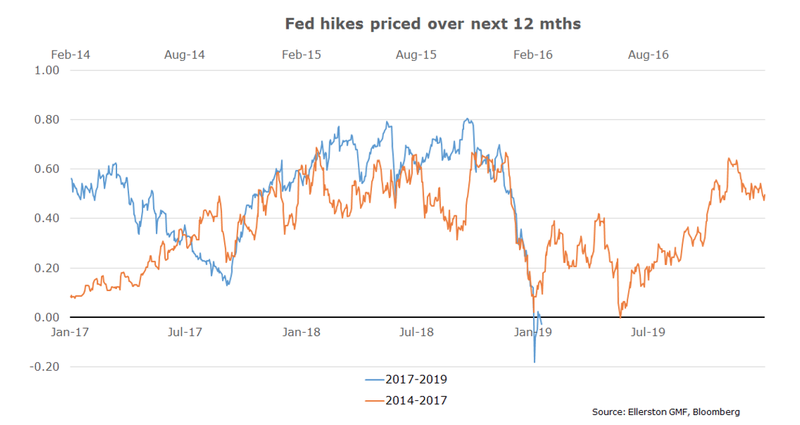 The repricing in 2016 of Fed hikes, from around 60 basis points to zero, was similarly decisive last month. This gives us a nice template for how the asset markets might behave. The chart above suggests credit will rally all year. And equities will return to new highs. What is also interesting is the Fed on hold stalled USD strength, if not weakened the USD. A proxy for the USD v Asia, the Singapore dollar, stands out. So if we like the 2016 (Powell) analogue, we like selling USD/SGD. And an equity rally. And a credit rally. And a repricing of Fed hikes. Slowly. So should we position for this? Well you can’t possibly answer that without knowing the odds, the risk/reward for those positons. Are there good risk rewards? We went looking for good risk reward trades for this scenario over the next one to two months (as the repricing happens fairly quickly). We ended up buying USD/SGD puts, USD/SGD puts conditional on gold trading lower (gold should fall if risk sentiment improves), and USD/CNH puts with knock-outs. 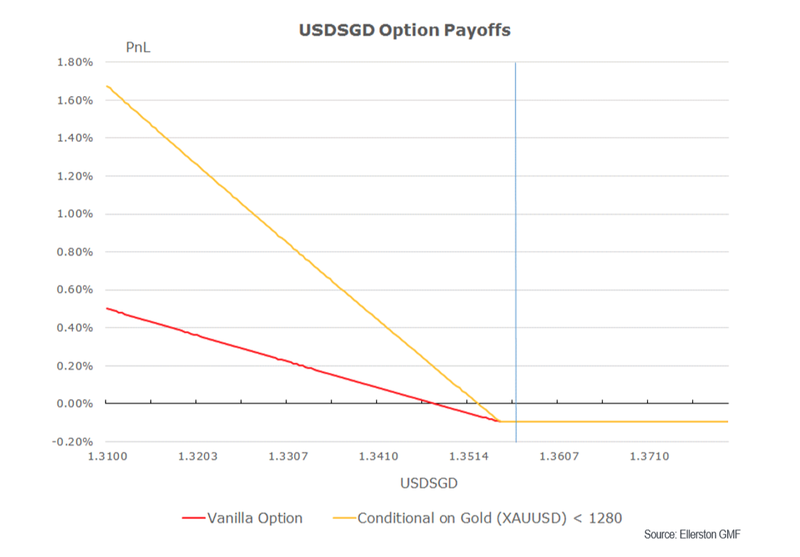 Respectively that is because SGD volatility is the cheapest in the FX world, conditional on gold adds a further 70% saving, and CNH volatility skew is one of the steepest in the FX world, which grants a 50-70% saving depending on the range we choose. By structuring these trades as we have, we can improve risk/rewards from an average 3 to one, to an average 10:1. Whether our assessment is that a repeat of 2016 is 30% likely or 70% likely, they are some bets worth taking. In early January we have risked 0.4% to make 2-3%. Why so short term? Well, firstly because the risk reward is much better. But more importantly, I don’t think the 2016 analogue can play for very long. Certainly not more than 6 months. Why? The US labour market is much tighter than it was in 2016, and wages are clearly accelerating. Within 6 months the market will be skirting a wage/inflation problem and the Fed will have to hike earlier than they did in 2016. Either way, we have 6 months of clear air right? Well only in the 2016 analogue. I’m not convinced we are out of the woods in the short term. There is still a reasonable chance, perhaps even likelihood, that we are playing out the 2000 analogue. And the problem with the 2000 analogue, or any bubble bursting, is the data is of no help. The bursting of the bubble drives the tightening in financial conditions, which then drives the slowdown (recession) in the economy. So let’s have a quick look at how 2000 played out. Firstly, the FCI would continue to tighten as the bubble bursts. 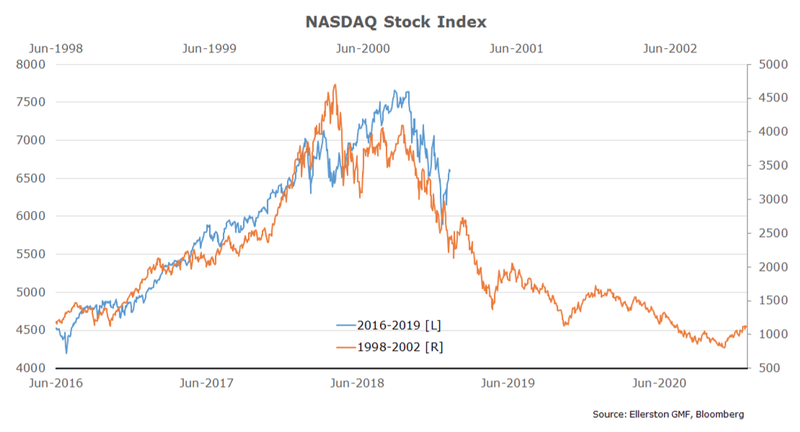 In 2000 it was an equity bubble bursting that drove the tightening, despite Fed rate cuts. This time it will more likely be a credit bubble bursting that will drive the tightening, though equities will also be dragged down and “do their part”. And the data will deteriorate due to the tightening in the FCI. But it won’t work. No one wants to borrow, and no one wants to lend, when asset prices are falling. What it does highlight though is the best trade when a bubble bursts is long fixed income. 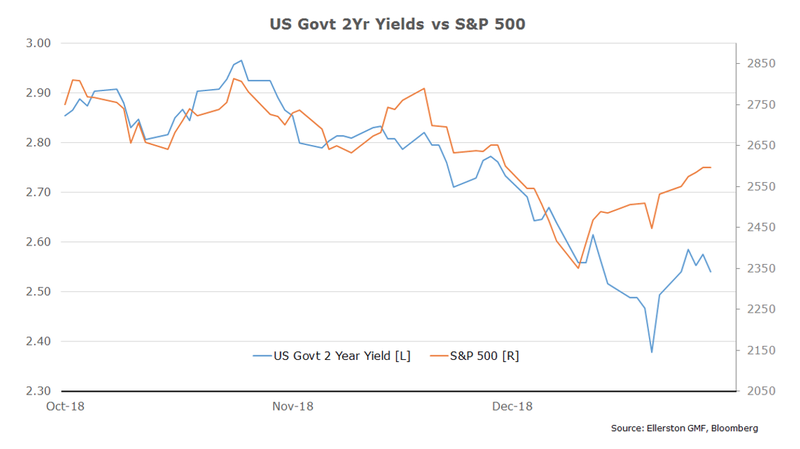 US 2 year yields are now trading lower in yield than they were when the S&P hit its low on Xmas eve. Now that the Fed has folded, expect this divergence to continue. Which means the best risk off trade is now likely to be long US fixed income, particularly around the 2 to 5 year part of the curve. Hence we are long 5 year rates (v 30 year rates). But not a large exposure. If the credit/equity market falters, we will add long positions in the 2 year sector. Quickly. Wages matched by productivity gains/Inflation contained. Fed moves to neutral/modestly restrictive, treasuries 2.8-3.4%. Business cycle extended, equities positively re-rate. Policy has not been this easy since the 60’s. Inflation accelerates. Fed cash rate and 10 year yields move to 4-5%. Recession risk surges, equities crash. 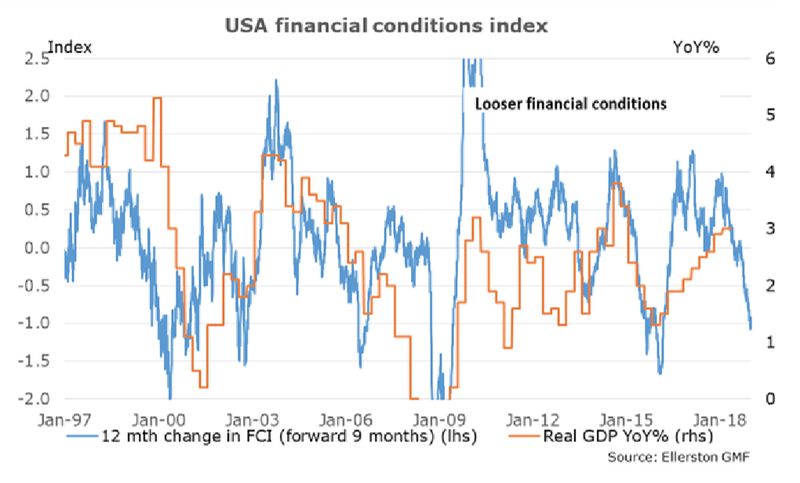 Tightening in financial conditions dramatically slows growth/cause recession. DM equities crash, Fed aborts, rates rally. Today we would put the highest probability on 3. I still think the 3 scenarios are the right framework. And in 2019, markets could embrace all 3 at various times. But labour markets are too tight and credit exposures/debt levels too high. Eventually all roads lead to 3. Moving between scenarios will continue to create large market moves which we believe will provide both large opportunities and large risks for investors. We continue to focus on keeping risk limited and risk/reward high, and are very excited about the opportunities we see/expect in 2019. Indeed one of those is the dog’s breakfast called Brexit. We actually have a reasonable exposure to a positive outcome. Why would anyone try and position for a Brexit outcome given the current mess? Quite simply the odds, dear Watson. Parliament settles on “Norway+” Brexit, or Common Market 2.0 (the only plan with enough support in the parliament to possibly pass, despite immigration concerns). The decision gets returned to the people via a new referendum. An election gets called and then a referendum. By the time you read this May’s plan will likely be rejected. Meanwhile parliament has passed a number of bills to ensure 5 can’t happen, and May will likely get replaced if she moves in that direction. None in the Tory party or DUP want to risk an election, as they will likely lose. And so that brings you back to 2 or 3. Two is a soft Brexit, and that would be a relief for the economy. And the polls suggest if another referendum were held the people would now vote to remain. For the economy and markets, scenario 4 and 5 are bad. And 1, 2 and 3 are good. Depending on who you debate, the “good” scenarios are between 60 and 90% likely, albeit it could take many months to get there. EURGPB volatility is near decade highs. At some point, we don’t know exactly when, but sometime over the next say 3 months, a decision will be reached and that high volatility will fall dramatically. The option market expects that to be a positive resolution for the UK relative to what could happen, and so the option market has a very large “skew” to options that capture a rally in GBP. We have constructed option trades that take advantage of all three of those features. And we believe they will provide roughly a 10:1 return if a decision on Brexit is reached over the next 2-3 months. We are risking 0.4% to make 4%. And one final word on 2018. We would have hoped to do much better for you, our investor. Nonetheless, in essence we were wrong. Not on the economy in the US, which proved very strong and wages are now clearly rising, but the path of the tightening in financial conditions. 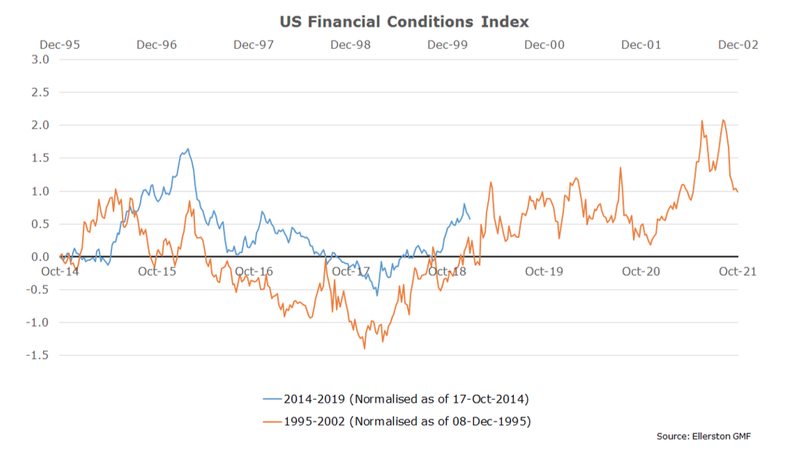 We had expected higher bond yields to do most of the work in tightening financial conditions. As you know we have talked about 3.5-4% US bond yields all year, and the year finished with yields at 2.68%! 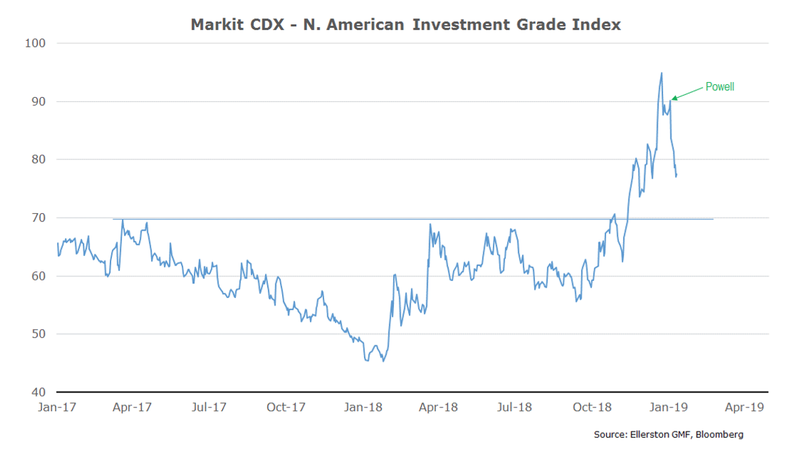 Of course they were at 3.25% as recently as November, but then the equity market tanked and the driver of the tightening in financial conditions pivoted from rates to equities and credit. As we wrote in recent months, we expected an element of this to play out, but not to the degree we saw. 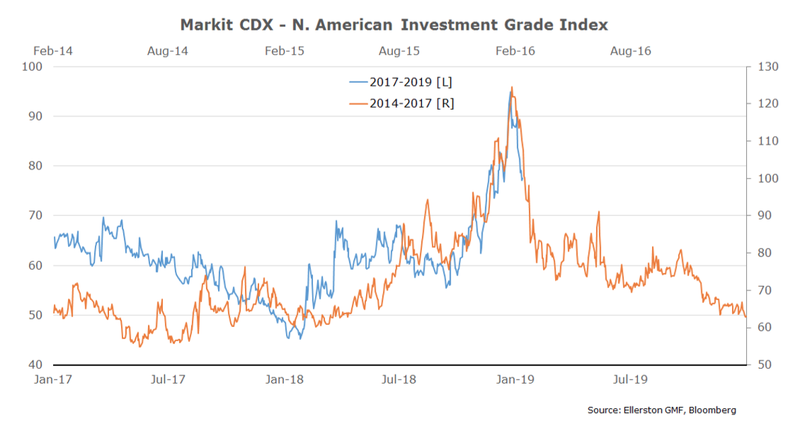 And perhaps quantitative tightening is having a bigger impact directly on credit and equity markets rather than bonds. Being the first episode in history, one can’t be sure. Nonetheless, had we been right, we would have returned handsomely for you. Why does that matter? Because it reinforces what I have been writing about above –risk/reward. Throughout the whole year we were positioned aggressively for higher rates in the US. Despite rates falling, our performance for the year was about flat (before fees and execution costs). Over 2018, we constructed 178 exposures. And our correlation to the equity market was zero. Interesting analysis. I am not an educated ecomonist, yet can understand waas is written. Like very much openess and objectivity, also selfirony.